With the new Minions movie finally coming out, Despicable Me is as trendy as ever! We’ve been big fans since it all began. 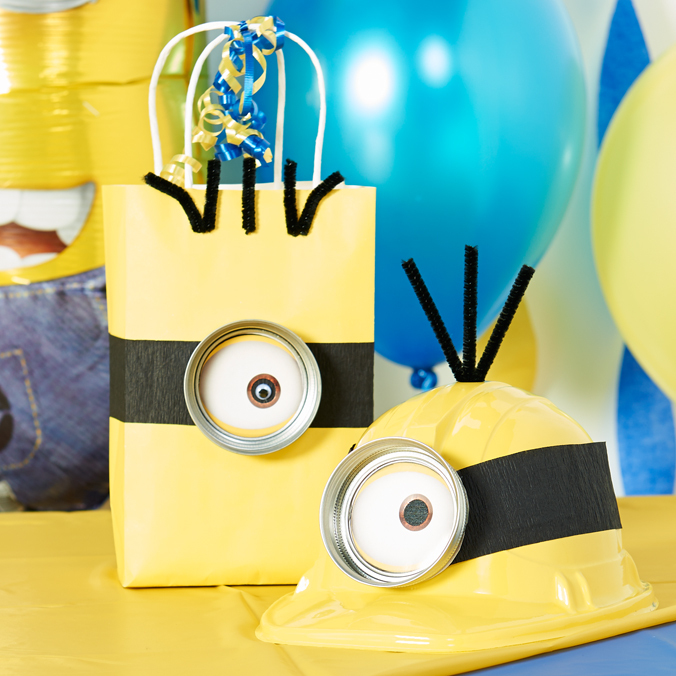 To celebrate (and help you celebrate), we’ve come up with some easy DIY Minions party ideas that anyone can make. Basically, we’re taking basic Minions party supplies like plates and napkins and showing you how to turn them into something extra special. Keep on reading to see the tutorials! Make boring balloons a little more exciting! For this Despicable Me backdrop, we used blue and yellow table covers, crepe paper, fluffy tissue paper puff decorations, regular party balloons, Despicable Me balloons, and curling ribbon. Click here to get everything in one easy kit! To put it all together, you’ll also need some regular Scotch tape and a tank of helium for the balloons. Start by simply folding your table covers into a layered triangular arrangement as shown above. Then, begin decorating the walls. Attach a piece of blue (or yellow) crepe paper near the top of your wall. At the bottom, cut it to the proper length and give it a few twists before securing with tape. Make more parallel twists of crepe just like that, alternating in color and a few inches apart as you move across the party space. Then, inflate your balloons and assemble your tissue puffs. Use matching shades of ribbon to hang the puffs and arrange the balloons. Try mixing things up by displaying pieces at different heights, as opposed to in a straight line. Also, if you don’t have any helium, you can just as easily suspend balloons from the ceiling. 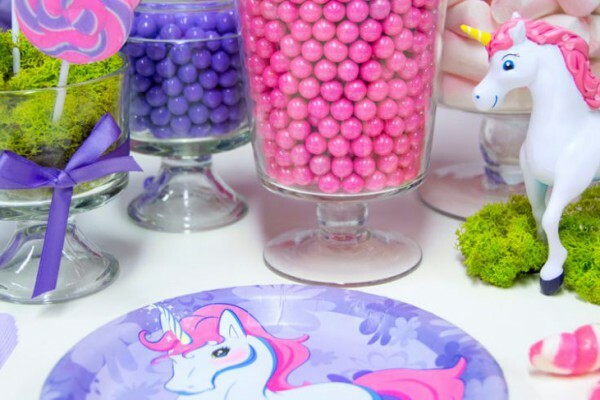 Napkins and plastic silverware are the essential party basics (unless you’re okay with turning your birthday cake into finger food), but it can be easy to turn them into something special! 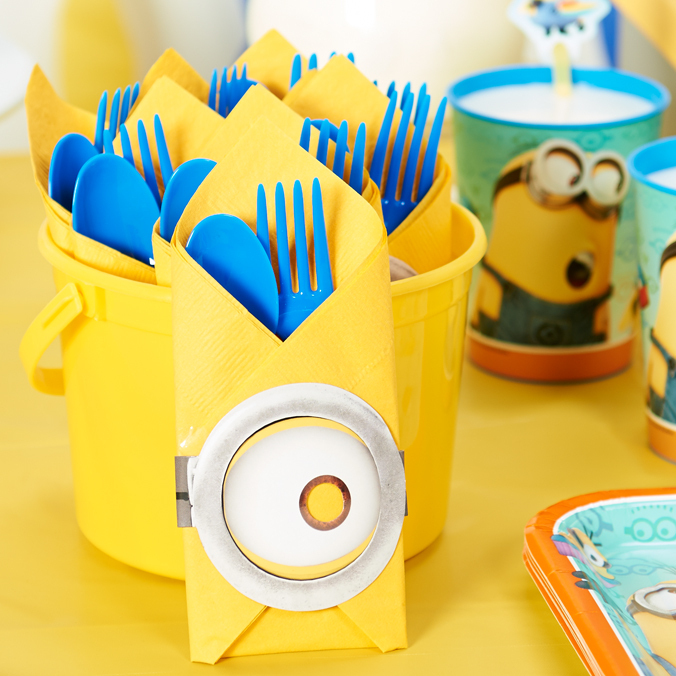 A simple napkin wrap with Minion flair makes for an easy DIY party project that anyone can do. To begin, take a yellow paper napkin and rotate it so that it’s arranged like a diamond in front of you. Place a plastic fork and spoon (we used blue ones) in the center, so that their ends almost come to the top corner of the napkin. Then, create a pocket by folding the bottom corner of the napkin upwards and the sides into the middle. Creasing the napkin as you fold will help it stay together for now. Paper Minion masks come with two eyes, but we’re only going to need one for this purpose. So, cut one of the eyes off, and use the remainder to wrap around the napkin. Tape it together in the back to form an easy napkin ring in the shape of some Minion goggles! When you’re finished with enough table settings for every guest, display them in a yellow plastic pail. Sweet treats are always welcomed by all the guests, but it’s easy to craft them into an amazing decoration for the table, too. Almost too adorable to devour! The bases of this DIY decoration are the mini metal buckets, pre-painted in the proper shade of Minion yellow. Paper Minion goggles give them the right look – secure them snugly with a piece of tape in back. Time to fill them up! Inside the buckets, we placed some pieces of Styrofoam (not included in the kit). Then, lollipop sticks were stuck inside to be displayed and held upright. 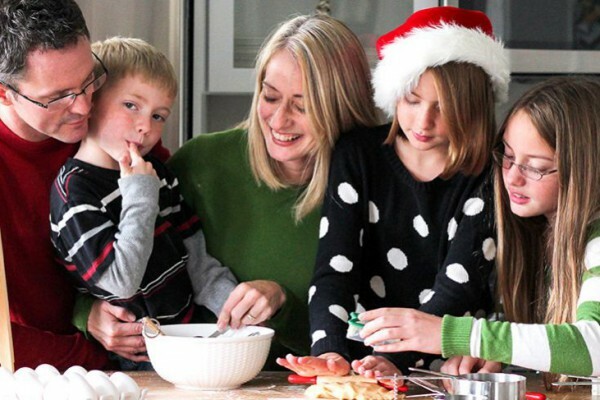 In a pinch, tightly packed paper or cardboard layers can be used, too. Finish by disguising the base of the bucket with some blue tulle fabric. Alternately, you can also disguise the base of the bucket with more candy (we like that version better, to be honest with you)! Yellow and white swirly suckers, along with colored Sixlet candies, are included in the kit, but feel more than free to use your child’s favorites. To give your tablescape some added texture and height, raise your DIY centerpieces to varying levels with wrapped boxes or books. Here’s an adorable way to make anything into a Minion! Mason jar lids + black crepe paper + googly eyes = Minion goggles. Who knew? We’ve done this project with a yellow party favor gift bag and a toy hard hat, but you can adapt it to just about anything. Soda bottles and snack containers on the food table, or even the birthday gifts themselves are both great choices. First, you’ll need to cut a piece of black crepe to fit around your object to make the “headband.” Loop it around loosely to find the right length, snip it, and fix it in place with some Scotch tape. Mason jar lid rings (not included in kit) make the most perfect frames for our Minion goggles, but we need something to make the eyeball. These paper goggles are great – cut out one of the eyes and fit it into the lid ring. If it’s too small, you can always use some plain cardstock to mat it a little bit. Then, a single googly eye hot glued into place serves as the pupil. Hot glue your finished Minion goggle to the crepe headband, too. For a finishing touch, give your Minions some scraggles of hair on top! Cut up a couple black pipe cleaners (not included in kit) and hot glue away. 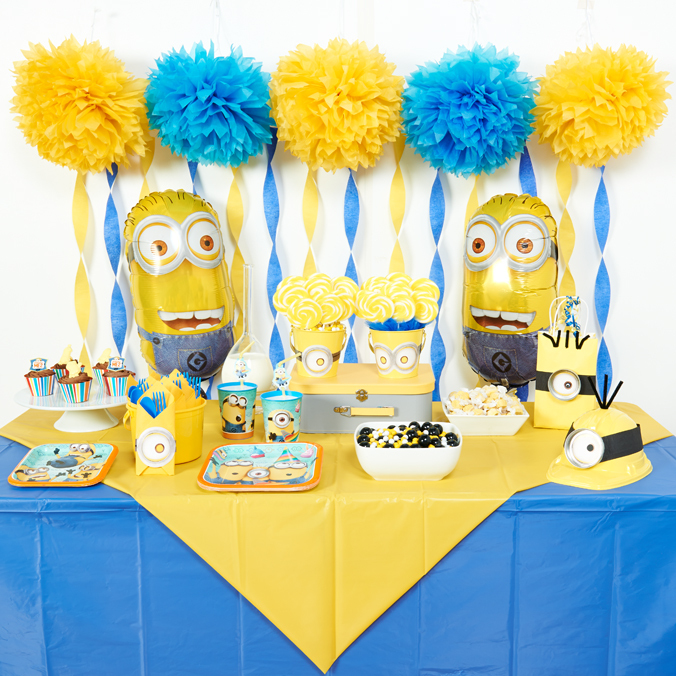 Have we inspired you to throw a Despicable Me party for your little Minion? 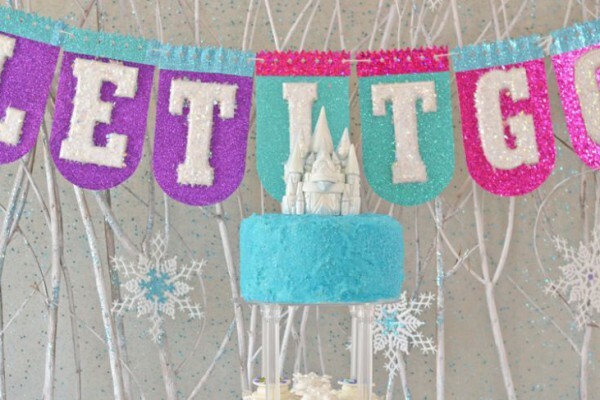 What kind of DIY party ideas and party themes should we come up with next? If you liked this post and want to see more like it, then let us know! Visit our Facebook page or find us on Twitter @BirthdayExpress and tell us what you think. 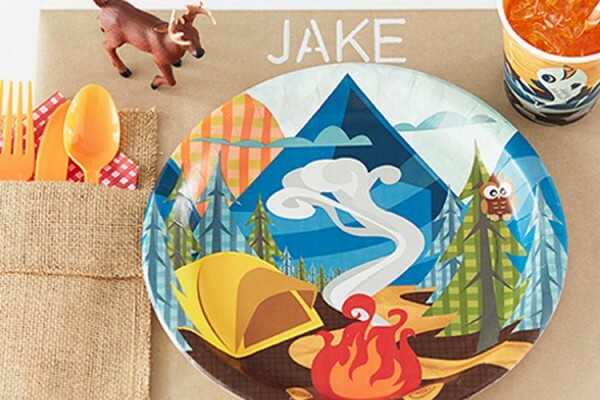 Check out our Pinterest boards for even more amazingly easy party ideas for kids, too. 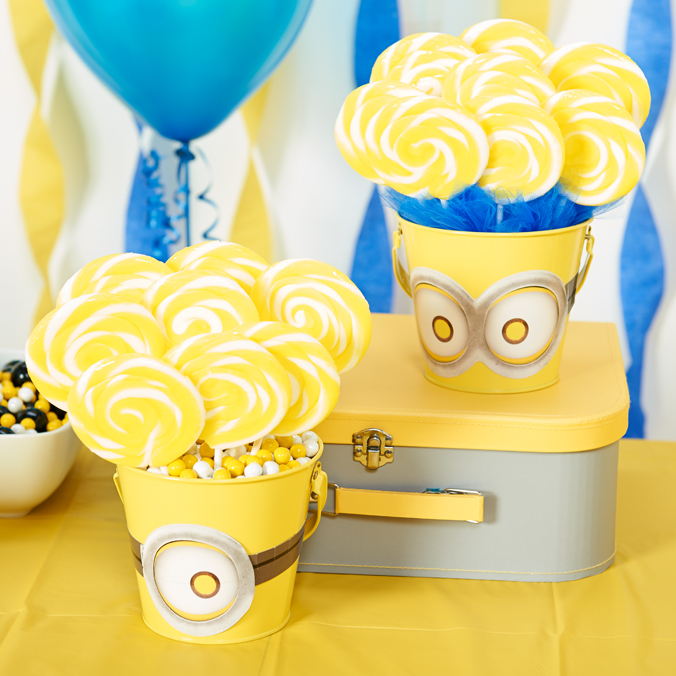 Click here to browse the entire Minions party supplies collection on Birthday Express.